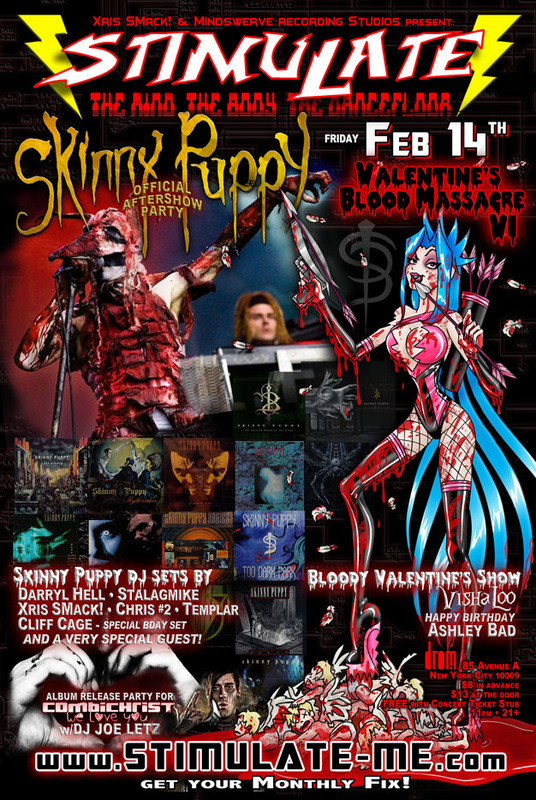 02/14/14 – STIMULATE Annual Valentine\\\’s Blood Massacre and OFFICIAL Skinny Puppy AfterShow Party! STIMULATE Annual Valentine's Blood Massacre and OFFICIAL Skinny Puppy AfterShow Party! and Record Release Party for COMBICHRIST's "We Love You"
the Annual Valentine's Blood Massacre VI (@ Drom) - VALENTINE'S DAY! SKINNY PUPPY OFFICIAL AFTERSHOW Party! also the Birthdays's of Resident DJ CLIFF CAGE and our own ASHLEY BAD! Special Skinny Puppy sets by Darryl Hell, Stalagmike and a Very Special Guest!!! :blood, Blood Massacre, Skinny Puppy, STIMULATE, Valentine's, Valentine's Day, Xris SMack!